Mango Peach hand pies are a favorite! Love for fresh herbs dominates my life, everyone knows this. 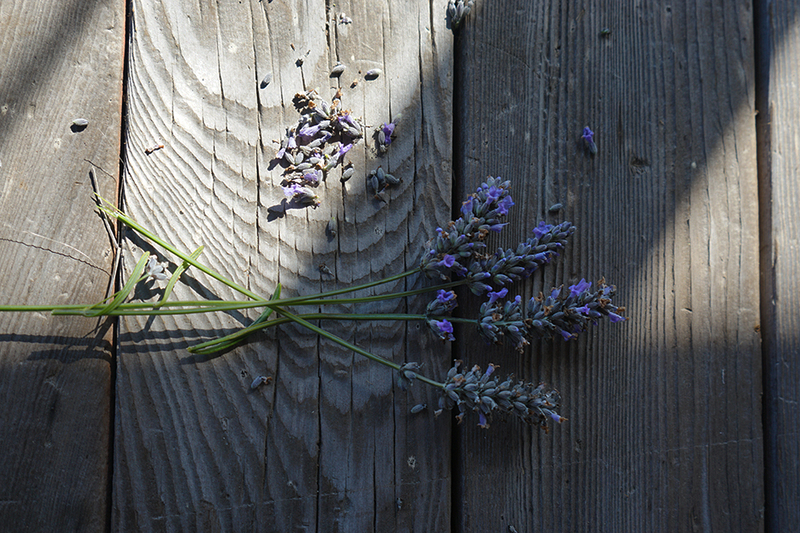 Herbs are my salt and a way for me to pull or push some of nature’s loveliest flavors. Fresh herbs offer me the extraordinary ability to create works of art by syphoning flavor and pointing essences, accenting nature’s best and worst offerings. Mangoes, which came into my life through organic agricultural work, are a bit of a “later in life” pleasure for me. I remember tasting them as child in Nicaragua and finding soap as the predominant flavor… I have forever been empathetic to the “cilantro soap” folks. My passion for cooking and teaching about food, coupled with a knack for selling, has had me on somewhat of a mango quest the last 10+ years. I have come to realize the tremendous versatility of this tropical creature as I have been playing with ideas, recipes and generally learning everything I can about this kind of fruit. 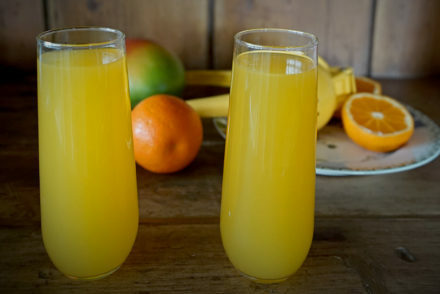 The mango’s ability to continuously be re-discovered, in recipes and general tastes and flavors, throughout the ever-changing season caught my attention early on. Despite their original soapy taste, mangoes have become a staple in my food ideas playground, not just because of work but in general, as I get to experience constant joy in the discovery process when playing with recipes and ideas. The mango joy I feel is similar to my immense joy in playing with herbs. The ideas and art are really endless and I have found a significant amount of satisfaction in this exploration. My love of herbs found a perfect home in mangoes. From the sweet to the savory, the paring combination of possibilities for herbs and mangoes has my head spinning with a great deal of delight. My work is always joyful, and as I cook up ideas for recipes or simply make myself dinner, I have mangoes and herbs as predominant ingredients. Summer stone fruit used to be mangoes’ nemesis in the business of exporting, buying and selling. Mangoes from Mexico (my main work), are available from February – August with a peak in July. 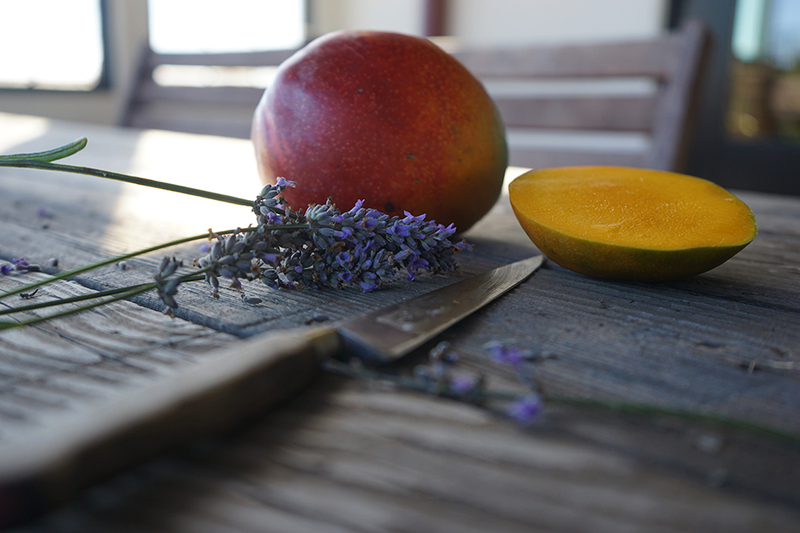 Oftentimes the mango peak coincides with the stone fruit peak all over the USA and Canada. 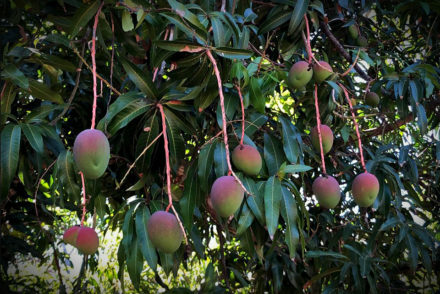 Retailers, often driven by consumers, would reduce mango display sizes to fill them up with stone fruit, making prices plummet on mangoes all during a time when growers had the most volumes. But in the past several years we have seen peak season demand from consumers, and thus retailers, for mangoes. More and more customers are taking a permanent liking to mangoes and are able to make room on their grocery lists for them, as well as stone fruit. In a way, mangoes are becoming a summer staple just like stone fruit has been. Consumers are discovering, just like I am, the versatility of the mango, and as more education becomes available on how to select, store, cut them and how to use them, more and more are sold and incorporated into everyday cooking and eating by shoppers all over the USA and Canada. I really try to keep my cooking and recipe writing seasonal and mostly local, so it was just a matter of time before I stumbled upon mango and summer stone fruit hand pies. I have know for a while about the heavenly pairing of mangoes and peaches, they are definitely one of those hard to describe, perfect pairing partners. I think I first had mango peach ice cream somewhere in NYC and fell in love instantly. This year, tasked with a 4th of July party and wanting to keep my menu seasonal and local while still incorporating my work and love of mangoes and herbs, I decided to go all-out and make mango & summer stone fruit hand pies, using herbs to emphasize the perfumed essence of the mango and the summer stone fruit. 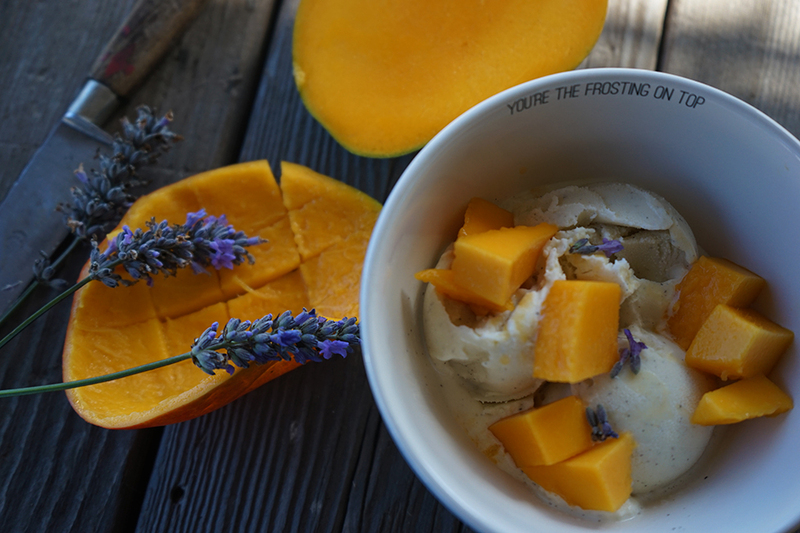 I made peach mango and added fresh lavender flower essences. I also made some nectarine and mango with peach and brought in a bit extra tart essence by adding a few lemon verbena leaves. Not only did I flavor the pie fillings, but added a few of the chopped herbs and flowers as well. I also made some without mango, which you see pictured: blueberry lavender and Santa Rosa plum and rosemary. They are the perfect sweet summertime snack and allow for the utmost in creativity for kitchen diversity junkies like me! 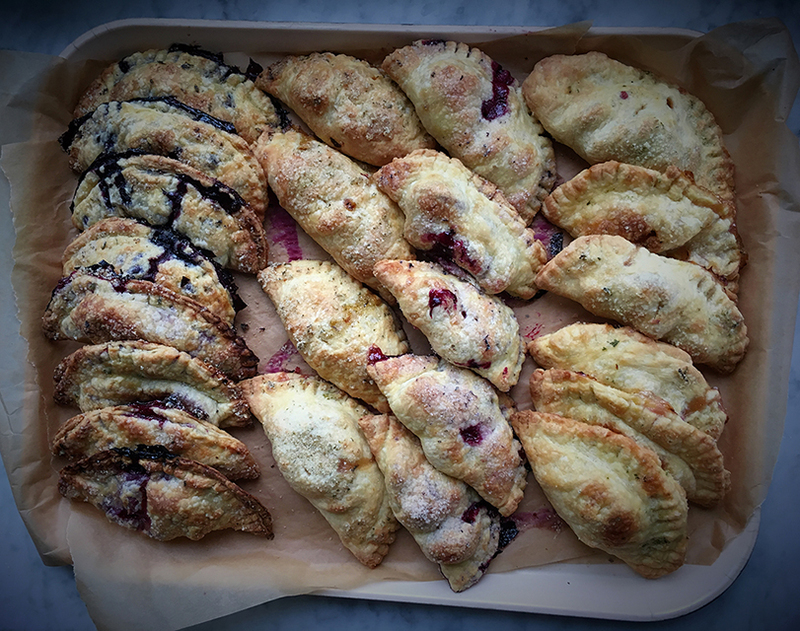 This is the absolute favorite recipe of this summer’s mango and summer fruit hand pies, tested this 4th of July: the Mango Peach Lavender Hand Pies! Any pie crust recipe will work for a hand pie. I like to add a bit of sweetener to mine and my secret vodka and/or vinegar trick, which I believe keeps the crust flaky, especially when I don’t refrigerate it (as most people do) before rolling out! I’m impatient, but it works! In a large mixing bowl combine the flour, salt and sugar and mix well. Add the butter pieces and using your fingers and hands, rub the butter into the flour mixture, crumbling it all until reaching a course consistency or a crumbly meal. It’s important for the hand pie crust not to have any large chunks of butter so make sure you crumble all of the big chunks so that they are at a maximum the size of a pea. You can alternately use a fork or a pastry cutter, or even a food processor. Next add the water, start by adding 2 tablespoons and stirring well. Using your hands, begin to squeeze the dough into a ball, add another tablespoon of the ice water and squeeze together and push the dough onto the floured surface so that it gets pushed together and mixed via this pushing. Do this a few times, making sure not to knead or mix the dough too much. You may need to add another tablespoon of water if the mixture is not sticking together as desired. Once the dough is mixed, divide it in half and shape each one (with as little handling as possible) into a flat disc about 1 ½ inches thick. Wrap the halves separately in plastic and place in the refrigerator for about an hour (the dough can be refrigerated for up to a week before using or frozen for future use). Alternatively, you can skip the refrigeration step. My partner, the infamous pie maker, taught me this. He never rarely does the refrigerated part when making pies and pie crust, and his pies turn out fabulous. For the hand pies pictured we skipped the refrigerated step. Gently mix together the mango, peaches, coconut or raw sugar, lemon juice, cornstarch and 1 teaspoon of the lavender flowers. Set aside. Roll out dough on a lightly floured surface into a large rectangle. Cut out 5-6 individual rectangles. Mound a few spoonfuls of the fruit in the center of each rectangle. Fold the dough over and press the edges to seal, dipping your fingers in a little water to help seal. Place the pies on a baking sheet, lined with parchment paper. Brush the pies with an egg wash and sprinkle the last teaspoon of lavender flowers and a little sugar on top of them. Bake for about 30-40 minutes or until crust is golden brown. Make sure you turn the baking tray half way through for even cooking. Allow to cool and serve warm or at room temperature.